Many homeowners neglect their garage when it comes to home security. 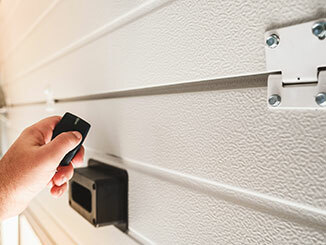 It’s easy to overlook this part of your house, but you'd be surprised how burglars can easily gain access to the rest of your home by simply getting inside the garage. Not only does it house some of your most valuable possessions, but it’s also often connected directly to your house. Anyone who breaks inside this room can usually break into the rest of the house too, so it’s essential to ensure this part of your home is properly secured against intruders. There are numerous factors that make it hard for thieves to gain entry to your property. Depending on your situation, you might need to invest in additional security features - if you’re in a particularly high-risk area, for instance. Some door types are more secure than others. An “up-and-over” door, for instance, is more vulnerable than a roller or a sectional model. The stronger your door is, the harder it’ll be for thieves to break in. Plastic and aluminum panels are the cheapest and the weakest options, while steel panels provides additional protection. Wooden doors are extremely resilient, since they can’t be bent with a crowbar like metal panels can. They can be broken, of course, but that will usually create a lot of noise, which is what intruders are looking to avoid. The number and quality of locks you have makes a huge difference in determining how secure it is. A lot of modern garage door models come with multiple locks, making it much harder for thieves to gain entry. If your system doesn't have those, consider getting some installed. Modern opener models also have a digital lock option, which prevents anyone from using the unit until this feature is disengaged. Garage door remote controls transmit a particular code to the opener, and cunning thieves have found a way to duplicate this. You can protect against this by routinely reprogramming the opener and changing its access codes, or, you can simply invest in a new opener which changes codes every time it’s used; brands like Genie, Chamberlain and LiftMaster offer models that implement this technology. If you're interested in getting one, our team can help. These days there are a lot of different options for remote surveillance of your property. Companies like Ring offer plenty of WiFi-enabled cameras, often with night vision, and many garage doors can be connected to your home’s burglar alarm as well. A set of motion-detection lights is often enough to scare off a prospective thief, and it is also a great safety investment if you ever come home late. Many modern automatic door systems are much more secure than older ones. If your home is fitted with an old system, we strongly recommend investing in a modern replacement - contact our team at Garage Door Repair Lilburn today to find out how we can help.